Meanderings and Muses: Is There a Favorite Writer you Patiently (or Impatiently) Await? There's a whole slew of new books coming out in the next few weeks. A lot of them are written by writers I love and who reside on my "auto-buy" list. Some of my once favorite writers sometimes fall off my auto-buy list after awhile, but there always seems to be someone new making their way there, so it remains a rather long list. And some of those who have fallen off sometimes even make a come back. My addiction to books is just that. And since it doesn't hurt anyone - not even myself - it's one I'm quite content to live with. I've lived with it since I was a little girl and I'll live with it till the day I die. How about you guys? Addicted to books? Do you have a favorite writer (or several) that you get impatient with if they miss that once a year release? I'm picking one, and only one, very favorite writer who has a new book coming out this year. Gloriosa, this man makes me nuts 'cause he takes so long between books. But. As soon as his newest comes out, all is forgiven. It has been 14 years since his last novel. Know who I'm talking about?? In my mind - he is The Master of Southern Literature. His new, long awaited novel, "South of Broad" will be released in September. Hooray Hooray! Since "Beach Music," he has written "My Losing Season," (From Fantastic Fiction - "In My Losing Season Pat Conroy has written an American classic about young men and the bonds they form, about losing and the lessons it imparts, about finding one's voice and one's self in the midst of defeat. And in his trademark language, we see the young Conroy walk from his life as an athlete to the writer the world knows him to be. "), and "The Pat Conroy Cookbook: Recipes of My Life" - NOT your typical cookbook, by any means. I loved both these books. I still keep the cookbook close at hand, because every once in awhile I want Mr. Conroy to tell me a story. Don't we all, at some point, love to be told a story? and who better at this than Pat Conroy? The man loves words, and language and is a storyteller extraordinaire. 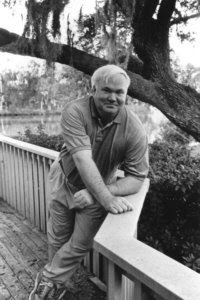 One of my favorite blogs, Book Chase - by Sam Sattler, was where I first learned the news with this entry - New Pat Conroy novel expected. Book Chase is also where I got to watch Mr. Conroy being interviewed by his lovely bride, author Cassandra King. AND, through Book Chase, I learned even more news about the book from a friend and early reader of Mr. Conroy - Mr. Sean Scapellato, who writes the "Thoughts on Writing From a Cul-de-Sac" blogspot. Don't you love the blogging community?! I swear - you can find just about anything you want if you search around long enough. There are the most interesting people out there writing about a world of stuff. Anything and everything. That's what makes the world go around, isn't it? That gift of curiosity. If you get a sudden hankering to read and learn a little about the most mundane, or the most arcane, or the most esoteric subject matter imaginable, you can find it. But, enough of that - I meander. I want to squeal about how excited I am about "South of Broad." It sounds to be just what we expect, and love, of Pat Conroy. Sweeping sagas that are so very southern, so emotional, and oh, so very "Pat Conroy." I don't think you could pick up anything this man has written, read more than a few words and not know pretty quickly who it was written by. I have one little story. When Donald and I were still living in Atlanta, Mr. Conroy did a signing of "Beach Music," and we, of course, went to Mr. Conroy's signing. My first edition personally inscribed and autographed copy of this marvelous book is one of my life's treasures. As is remembering the conversation we had regarding Fripp Island. While we waited in line, Donald kept saying things like "now you need to talk to him - don't freeze up, tell him how much you admire his work, tell him you love Fripp Island - say something!!" So, when it came time to hand this great man my book, I spurted out "I love Fripp Island. Wish I lived there." (brilliant, huh?! pfft). Mr. Conroy stood up, left his chair, came around the table, asked our names, shook our hands, leaned against the table and said "You know Fripp Island? Tell me how you know Fripp." I could have died. But I rambled on at some length about how a group of very close friends would go to Fripp every year for Memorial Day weekend. How we would always rent the same big old house at the very tippy end of the island and how we did that for several years and how those weekends were some of the loveliest of my life. Without missing a beat, he said - "I've heard of you! Weren't you and your friends told to leave the island and never return?!" And threw his head back and laughed a big booming, from the soul, laugh. And so did I. That, of course, never happened, but that he could even just say such an outrageous thing, made me just want to laugh with him, and kneel at his feet. He then proceeded to chat with us at length about Fripp, and his love for the island, acting as though we were the only people in the room with him at the time. I was honored by his attentiveness, and completely in awe of his graciousness. If I had not been a huge fan before, that did it. He's funny, ever so personable, I love him and he is one of my heroes. We all need heroes. I've never been to Fripp but will be spending a week on Harbor Island May 2-9, an annual event since 2004 for me and my oldest friends (since 8th grade for me, the latecomer, some of them knew each other pre-kindergarten). I'm looking forward to friends, sun, sand, strawberries and maybe shrimp, depending on season opening. We'll probably go to Plum's in Beaufort for some pimento-cheese sandwiches and then to the bookstore where I might buy the new Kathryn Wall book. EEE! Can't wait! Also have trouble waiting for the next Phil Rickman book. You and best old buddies at the beach for a week - now what could be more fun than that??! We'll be heading to the beach the day you're heading home. Topsail Island. We'll be there May 9-16, and looking forward to all the same things you are. The strawberries ought to be coming in nicely about then. And there is nothing tastier than those fresh strawberries grown on the coast. Yummmmy. I have ordered Kathryn Wall's newest and I hope it gets here in time to go with me. Isn't that just a terrific series?! I am, for sure, taking Kathryn Stockett's THE HELP. That's a great Pat Conroy story, Kaye, and I am sure it's an experience you will remember forever. Thanks so much for the links to Book Chase. 1st! You know I have so many favorites it's hard to narrow then down to a list. I know this I will await with baited breath for every Kathryn Stockett book from here on out! You better take more than The Help cause you ain't gonna be able to lay it down!!! What a lovely blog you have! I must admit, the only Conroy book I have read is "Prince of Tides," but I thoroughly enjoyed the writing. I must catch up. I am so glad you met your hero. What a wonderful man. Sam, hi! Thanks for dropping by. I LOVE Book Chase - it's a great blog and one you should be quite proud of. And Thank YOU for being the one to let me know we'll be graced with a new Pat Conroy this year. I'm over the moon excited! Carol, hey there. How was your shopping trip to Meridian?! I truly can't wait to get into THE HELP - I know I'm going to love it. I haven't started packing any clothes for our trip to the beach, but you know I've got a big canvas tote bag that I'm putting books in to take!! Susan, thank you!! Compliments regarding my little Meanderings and Muses warm my heart. and I hope you'll come back often. Kaye Darlin', as always, your enthusiasm cheers me up. Wish I could join your and Donald at the beach. Wish you could too, Earl! It won't be the same as being in Ocean City, and we'll miss that boardwalk. Maybe next year. and you and Carol can meet us there! Now how fun would that be?! I'm impatiently awaiting Carolyn Haines's next stand-alone. I've enjoyed her Bones series, but her stand-alones -- Revenant, Penumbra, Fever Moon -- are replete with wonderfully alive characters and settings. Haines is a magician with words, IMHO. I have been working on Hetta Coffey #4 (Just Deserts) for over a year and decided it wasn't any good and started over. Ii am impatiently awaiting myself. Someone kick-start me. This is such an awesome post, Kaye! I'm catching up after my trip, but you know I love Pat Conroy, too, and am looking forward to this release. Your story started sounding like me meeting Robert Crais last weekend. I got to the front of the line and started babbling, "I'm a blogger from Ohio and I came here to see YOU." Oy vey. Very suave! But then he started chatting with me about what a great event the FOB is and an opportunity for book lovers to congregate. Then he asked if I brought my camera - OF COURSE I DID! I even brought my photographer! LOL Anyway...Robert Crais is one of my auto-buys and he's not going to release his next book until 2010, so have to wait on him. I also autobuy Alafair Burke, Michael Koryta, Thomas Holland, Chris Grabenstein, Linda Fairstein...oh geez, I think I have a problem! LOL I also believe that Jeff Cohen will be added to that list. I finally read my first Elliot Freed over vacation. There's just so many wonderful books, aren't there?